Hundreds of jobless Californians, who rely on their unemployment checks, have been taking their complaints to Facebook. A computer glitch has delayed unemployment checks for about 80,000 Californians, many of whom depend on the money to pay bills and feed their families. The delays started after the California Employment Development Department upgraded its 30-year-old payment processing system over the Labor Day weekend. Since then, hundreds of jobless Californians, who rely on the checks, have been taking their complaints to Facebook. Carol Malichky, 49, of Glendale, Calif. said she hasn't received five weeks of checks, totaling more than $1,000. She was laid off from her job as a massage therapist in July. "I am afraid I will be homeless next month," she said. "I went through all of my savings to pay last month's bills and rent. I felt EDD was a lifeline to get me through that period of time, but now I have no money for food, bills, etc." Malichky is looking for a job, but with just $1.75 in her checking account, she can barely afford bus fare. The new system was designed by international accounting and consulting firm Deloitte. The glitches come in the wake of similar problems in July, when Massachusetts' unemployment processing system was replaced, also by Deloitte. After the new system was instituted, it was plagued with errors. Hundreds of Massachusetts residents were sent bills instead of unemployment checks. Others experienced delays, like in California. Deloitte did not respond to requests for comment. Meanwhile in California, Nina Montaño Peralta, 51, from Upland had worked for the city of Rancho Cucamonga for 17 years, when her clerical job was eliminated due to local budget cuts last year. A widow, living with her also-unemployed sister, Peralta depended on a part-time job at the Ross Dress for Less store and biweekly $750 unemployment checks ever since then. But the money stopped coming three weeks ago. "It's been horrible," she said. "I sold some of my jewelry. I'm literally praying and praying. I keep asking God -- I just want to pay my rent." 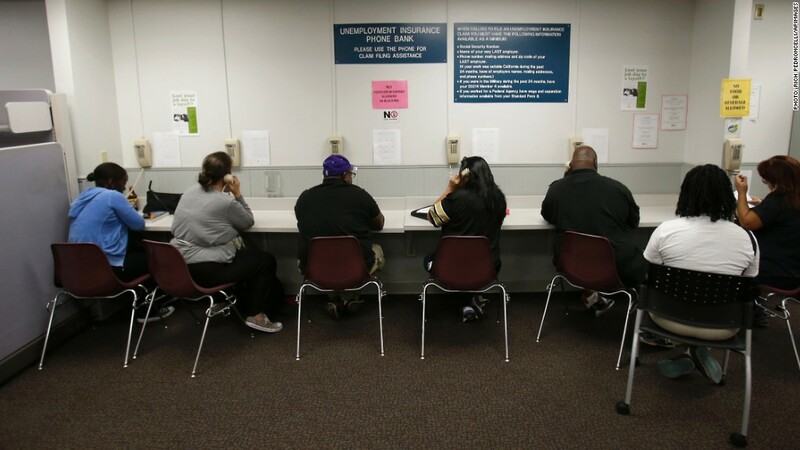 Exacerbating the situation are long waits on the employment department's automated phone systems. Due to federal budget cuts, EDD's phone lines are staffed by people only four hours a day. Even during that window, the phone lines are often so jammed, the system will automatically hang up on callers. "I'm supposed to be looking for work, but you literally have to devote two or three hours to get through to a person when you call," Peralta said. "You have to call, then you keep pressing zero to stay on hold, and often this cycle disconnects you." The EDD has been posting updates about the processing error on its website, Facebook and Twitter account. The department said its employees have been working around the clock, and on weekends, to process the backlog of claims. "The staff here at the EDD truly do understand just how important unemployment benefits are to our customers -- a critical lifeline while they are out of work," EDD said in a statement online. "We have had staff working until 4 or 5 in the morning and then returning a few hours later, dedicated to getting us over this hump in the transition period for this new system just as quickly as possible." The department also blamed federal budget cuts for shortage in staff, which has made it more difficult for the state to process unemployment claims in a timely manner. At the peak of the recession, the department had about 3,200 employees processing claims, but since then, they have slashed roughly 1,000 of those jobs. "We are unfortunately understaffed due to federal funding reductions at a time when demand remains more than twice what it was before the recent recession," it said.